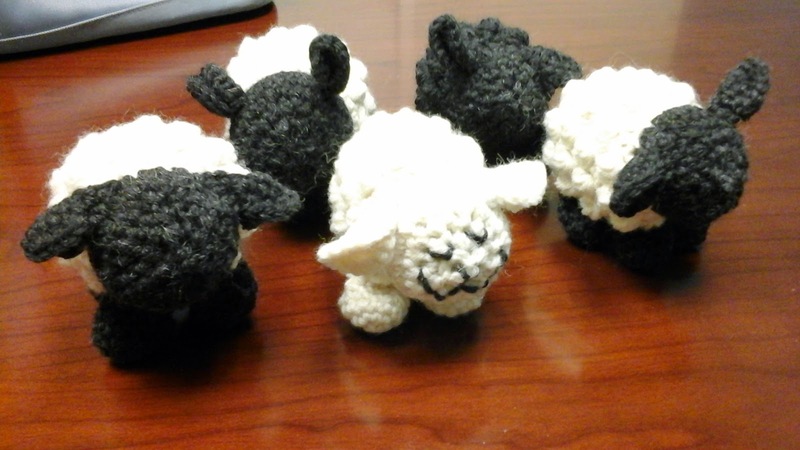 I made a small flock of sheep. I still have to embroider the faces on 4 of them, but they are otherwise complete. I have not been idol; I have been trying to clean and pack. We are moving soon, and preparations must be made. I will link to the pattern that I based these on later. I did not follow the pattern exactly, and when I link to it, I will tell you the modifications I made. I am somewhat saving my crafting for the summer, after we move. My job will change - I will no longer work full time outside the home. I will be homeschooling my children and being their mom full time. It will be a huge change, for me and them, but a good one I think. I will try to post more often, even with small things. There may be less knitting and crocheting, and more embroidery, as I have at least one project that I would like to complete before we move. Oh, and I got my sewing machine serviced, and returned to me! This is very exciting, as I have several sewing projects lined up as well. What are you working on? Do you have big plans for the summer?